Growing up I do not remember a time not rooting for the Boston Red Sox. However, growing up in Alaska didn't help matters since we never had a local MLB team to root for. 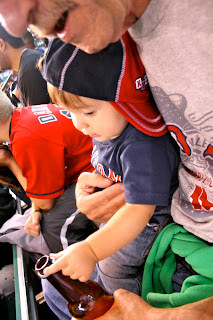 BUT, even if we did, our family would still be die hard Sox fans. 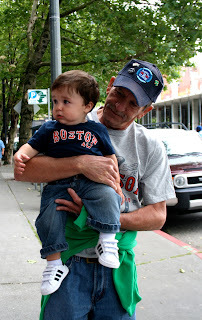 So it was serendipitous that my dad's visit and Max's first birthday fell on the day the Red Sox came to play the Mariners. My Oh My, what a great day! And although I am a Red Sox Fan at heart, I had to root for my Mariners. And guess what, we actually won! It was really special for me to see my father so happy, enjoying a hot dog, sitting with his grandson. These will be memories I will never forget.